Gamma Knife Radiosurgery is a non-invasive treatment method that can help those affected by brain tumours and other brain diseases. This procedure doesn’t really involve the use of knife but just beams of radiation. After this, the doctor or the Gamma Knife experts perform an MRI or CT scan, or if the patient is suffering from Arteriovenous malformation then Angiography may be required to appropriately locate the affected area. Data from the scans is then transferred into the computer, after which the course of treatment in planned. The team performing this procedure consists of a Neurosurgeon, Radiation Oncologist and a physicist, who together use their expertise to plan the course of action. Generally, this procedure takes one or two hours to complete, but depends on the complexities and location. Once the treatment plan is decided, then the patient is aptly positioned on the Gamma Knife couch. Then the patient is moved head first into the machine, and thus the treatment is initiated. The whole process typically goes on for an hour or more, during which the patient is totally comfortable and doesn’t feel the radiation. The total time taken depends on the condition that needs to be addressed and its location. Lastly, the patient automatically comes out of the machine, and the head frame is gently detached. The success rate of Gamma Knife surgery in India has attracted several medical tourists to India. Gamma Knife procedure has proven to be a highly effective treatment method and Neurology experts around the world are in favour of using this procedure more frequently. It is highly recognized for the level of precision it brings and for boosting the success rate. Gamma Knife Radiosurgery kills or shrinks the difficult brain tumors or hinders their growth almost 90 percent of the time. Further, it can even cure the most challenging, difficult-to-access brain tumors, which the more traditional brain surgeries can’t. This is done on an outpatient procedure and most of the time does not need a hospital stay. With no incision, there is no chance of bleeding and thus no infection and therefore the patients can get back to their routines the next day. Owing to these enormous numbers of benefits offered by this highly specialized procedure, more and more hospitals in India are adopting it. Also, the Neurologists in India, with the perfect set of skills are making this procedure all the more sought after as they have raised the success rates at par with the international benchmarks. 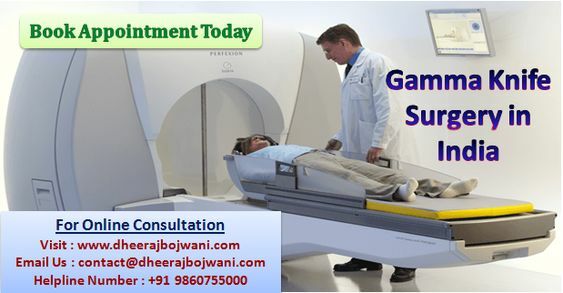 To know more about Success Rate of Gamma Knife Surgery in India, Click here. Get the avail medical tourism facilities at lowest price contact at contact@dheerajbojwani.com or dial +91 9860755000. The primary goal of Dheeraj Bojwani Consultants as a leading medical tourism facilitator is to make the lives of the international patients easier and provide them the best healthcare services while in India.